Plans announced this week to allow summer-born children to enter reception classes after their fifth birthday have been warmly welcomed by campaigners for change, but outstanding issues on school funding will need to be examined first, the government has confirmed. A Department for Education (DfE) spokesperson told Schools Week that a consultation on proposals to change the school admissions code to accommodate summer-born children starting school later than others in their age cohort will consider the issue. Schools minister Nick Gibb confirmed on Tuesday that the government would change the rules that currently allow schools to force summer-born children, held back from starting school until they turn five, into a year 1 class rather than reception. Announcing the changes, Mr Gibb said they were part of his government’s “plan to extend social justice and opportunity”, adding: “we want all children to have an equal chance to excel in school regardless of when they are born”. The rule change would mean children born between April and August could start school as late as the age of five years and five months, and would not leave until after their 19th birthday if they moved through sixth form – prompting questions about childcare access and post-16 education arrangements. Education Funding Agency funding only covers young people up to the age of 18, after which a 17.5 per cent reduction comes into effect. Funding for post-19 education comes from the Skills Funding Agency and is not available to schools. An Association of Colleges spokesperson said that allowing summer-born children to start school later would not have a “direct effect” on post-16 provision for 10 years, but added that it was a “rational response to evidence that shows achievement gaps depending on when children are born”. The Summer-Born Campaign has welcomed Mr Gibb’s announcement, but also raised concerns the changes might not go far enough. A spokesperson said: “We welcome the recent announcement and open letter from Nick Gibb and his proposed changes to the school admissions code. We look forward to engaging in the formal consultation process. Following the consultation, details of which are yet to be announced, the changes will need parliamentary approval. Parents can ALREADY do this. This is happening now, Children do not have to be in school until they are of compulsory school age. 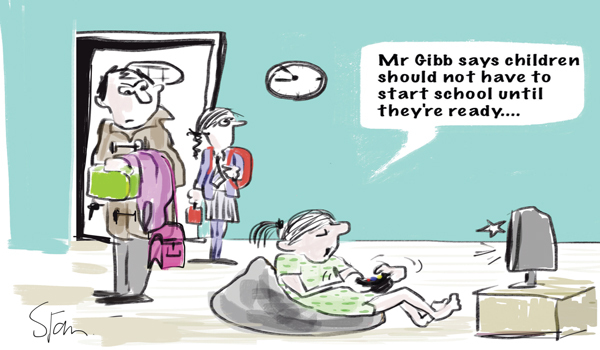 Nick Gibb is trying to amend the (post) code (lottery) of enforced missed years of education. There is no issue with funding. Children receive EEF until they are compulsory school age. Funding for early years education is already available until csa, which for #summerborn is the September after they turn five. So yes, they already have this provision. See FAQ she back of the current Summer Born Guidance. The only rule change is to show automatic right. A compulsory school age start in reception already allowed, but the decision is made by LA/Heads. Sorry, 2nd para should say “to allow” not show! This is incorrect. A child gets funded until compulsory school age so it has no bearing on childcare whatsoever. Why is the child in the picture playing computer games? Really if you are going to report on something I would have hoped that you made it factual. Funding is there for children already. Compulsory school age is “the term after a child’s 5th birthday” which for summerborn children is the following September. This is already law and already happening now. It is nothing new. The thing that Nick Gibb MP and ministers are ammending the code to accommodate is that: at the point the summer born child becomes of CSA some local admission authorities are forcing that child into yr1 thus making them miss a FULL year of essential education in reception class! It is and has been a postcode lottery for many children. The guidance is merely being ammended to prevent this from happening. Meaning summer born children will not be forced to miss a year of education, any year at all. Liverpool City Council have taken a pro-active approach to this and agreed that parents are best placed to make these decisions for their children. So summer borns can now enter in the September following their fourth birthday or at compulsory school age (September after they turn 5) this is fantastic news for summer born children here in Liverpool and my daughter will start reception class at age 5 next September. She is currently in the pre school there and funding does NOT stop. Funding for pre schoolers continues until CSA age which means they do get it until the term after they turn 5. Check your facts before writing articles please. The early years free hours are already available up to compulsory school age of 5, so there is no change and no problem there. There is also no change in the fact that summerborns can start school at 5 (and yes for April-borns that is 5 and 5 months). The ONLY change happening is that admissions authorities will have to admit these children into reception, rather than the current postcode lottery where some authorities allow reception starts while others force children into year 1. And as for provision at the other end – funding is available up to and including the term in which the student turns 19. So again no problem. Plus most summerborns who start reception at compulsory school age won’t turn 19 until after they’ve done their exams. this article is completely wrong! CSA (Compulsory school age) is already stated as the term after childs 5th birthday and many summer born children has been allowed to start on time (rather then early). No change regarding funding would be necesary. Summer born children and their parents would just get the automatic right to choose if their child is ready to start early or not and if not they would get the reasurance that their child will not be “punished” for being summer born by being forced to go early and struggle at school or worse being forced to skip a year!! I fully support Nick Gibbs proposed changes. A parent is the best placed person to know when their child is school ready. Parents should not be forced into situations where it’s a lottery where you live and what your individual LA’s interpretation of the DofE guidance is. Many European countries start their children’s formal education at 6yrs and beyond with preschool/ nursery play based provision on offer prior. Those countries have better examination results- if that is an important factor to you. My personal wish for my child is for them to be a socially and emotionally secure individual. Choice is what is important and if you’ve got a 4yr old ready and able to thrive at school then that’s the absolute right choice for them and if you have another child who is ready and able at 5 then that’s the absolute right choice for THAT child. Give parents the choice! Funding is also not an issue. Children receive funding until they are of CSAge. This is the same for post 16 studies. As Sam has said funding is until compulsory school age which is the term after five for all children. Those not starting school till csa continue to be funded at preschools and those who enter private schools at four have part of their fees paid by the government until the reach csa..
My September born has just started at a state school (she reaches csa on 1st January) and I have had to fill in the same form I did whilst she was in preschool so I am guessing schools can also claim this extra funding. Funding is already available till CSA which is 5. Parents already have a right to send summer born children after the term they reach CSA. The problem is the children are usually pushed to Year 1 missing Reception….that’s not right. The change Ministers announced is just to make sure no child will Reception Year. You should get some information before writing this as its really not right. Thank you for your submissions correcting the childcare funding issue. This fact has been corrected. A check was completed yesterday with the DfE spokesperson who said childcare would be included in the consultation. To deal with the post-16 funding point: at present it is possible to take 3 years to complete a level 3 course. This commonly happens, for instance, if a student decides at the end of the first year of A levels to start again with new subjects, or they decide to resit A levels for a third year to gain higher grades. If a summer-born child is placed in the lower year cohort, and remains there throughout, there could be a situation where they are unable to do a 3rd year because the funding would not be available. It is also the case that the year you are 18-turning-19, which would be case for a 2nd year of A levels for a summer born child in a lower year cohort, that the school receives 17.5% less funding for the pupil. By highlighting this issue now, the government has time to re-think funding, before it makes the changes, so that summer born children are not later disadvantaged by having less funding for their A levels, or be denied the opportunity of a resit year. Summer born children are statistically less likely to do well in their GCSEs and A levels so are most likely to need that resit year if they’re with their chronological age group. My hope for my son is that by starting him at a later age and allowing him to progress at his own pace, he will keep his love of learning and be better prepared to sit his exams as a teenager. I have summer born nephews who became disillusioned with school at an early age and dropped out completely by Year 9 and 10. Sixth form funding becomes irrelevant if a child is no longer engaged with their education by 16. From the teenagers point of view, staying in education until they’re almost 19 is something they’re entitled to do and the fact the school get less funding does not directly effect them (although I can imagine there is a possibility that schools and colleges could discourage them from enrolling but I personally wouldn’t take that lying down!). From the schools point of view I v can see it is a big issue and does need to be addressed. The money should follow the child and they should have access to the same funding whether they start school at 4 or 5. Maybe they could decrease the funding based on the prescribed days instead of for the whole cohort. Why can’t it extend to all 4 year olds then, why would a child born at the end of March be any more ready than a child born on 1st April? All children are different. My September born son would still be happy not to be in school now aged 8, my spring born daughter could have gone and organised the class at age 3. The whole system is going into meltdown with the 2 yr offer and the underfunded 30 hr childcare provision, this will just help make things more complicated for everyone involved. How about Summerborns currently at school? We are looking to move ours (August 27th) from his existing school after Year 2 to go to a new school for year 3. If allowed we would let him continue at his prtesent school till the end of Year 3 instead and then move him (to repeat Year 3 at his new school). If we’d had the chance when he started school he’d have started a year later but out LEA wouldnt allow it.